Having determined to post every week since the beginning 2014, I need to excuse myself this time, as I am already two days behind my schedule. My aunt and uncle visited us from India last week and was pretty excited about their arrival, so I was busy cleaning the house which is nearly impossible having a toddler at home but tried my best. Thought I would enjoy completely with them as I was going to see them after a year and thought to start my blog work on sunday, which is a day ahead of my schedule, but still felt okay with the plan…Well I had a wonderful time with them and they returned back to their son’s place by saturday evening.. I just spent sunday morning doing nothing but play with my son… and evening went in planning which recipe to post first 🙂 So, here I am with no further delay in posting a refreshing salad which was actually hated by my toddler “naturally” but my husband and I loved it and will be making it again! Whisk together lemon juice, olive oil and salt. Toss kale in this mixture, allow to stand for 10 minutes. 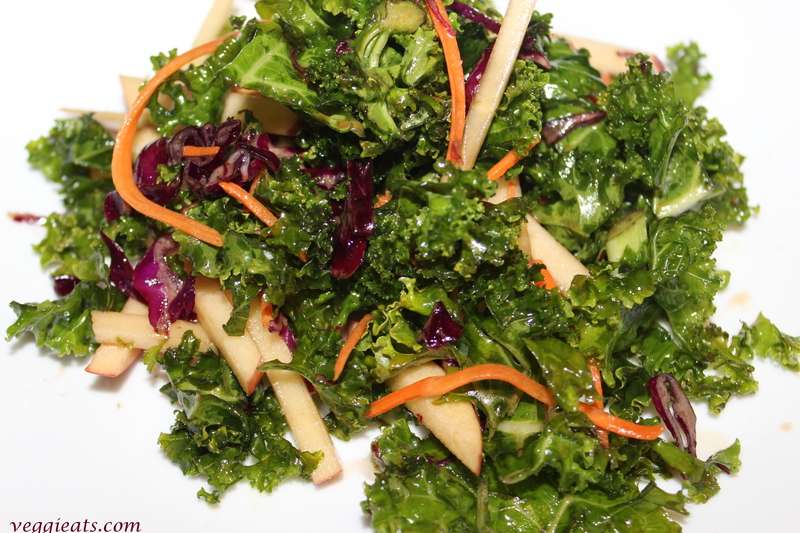 Massage the kale in between, which helps it to soften…. Then mix with dates, sliced apples, carrots, pumpkin seeds and cranberries. I also added some chopped purple cabbage which I had in hand. Add pepper and salt according to your taste, mix well and serve! A very refreshing salad and having massaged the kale removed the bitter taste and eating with apples and dates gave the perfect sweetness to the salad! I love the addition of fruits to salads! Spending time with relatives who live far away is a treasure! This is the most beautiful kale salad I’ve ever seen! I know I’d love it! 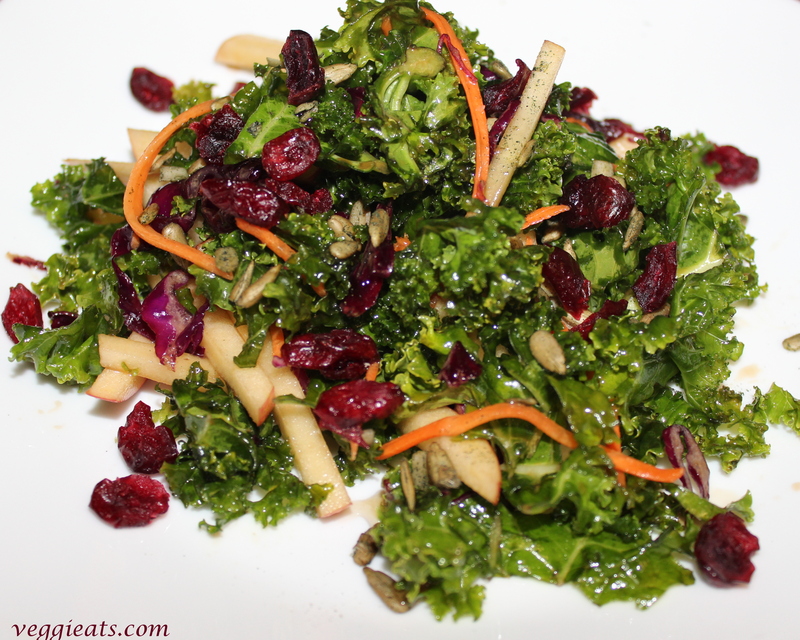 I love the apple and the cranberries in this kale salad…looks delicious Deepti. This looks divine! 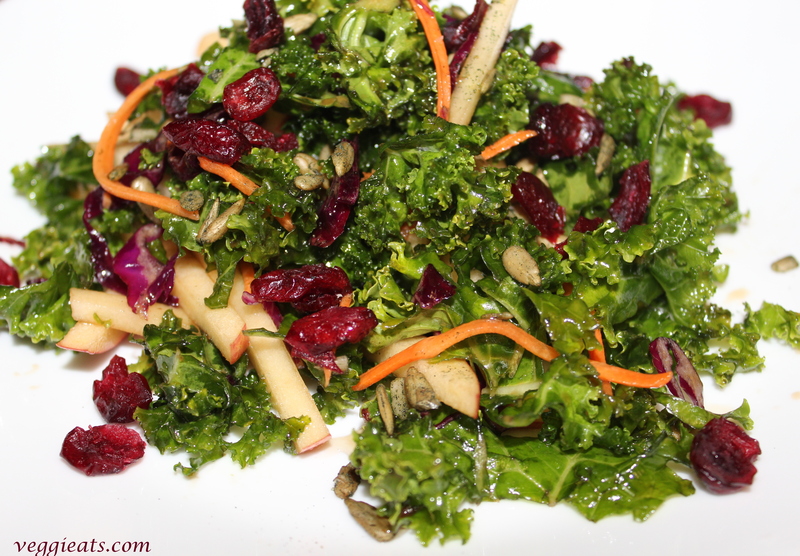 I am a fan of kale…I can say that I could devour this plate of goodness in a sec! Deepti, oh, your kale sald with all those lovely ingredients looks divine – so healthy and colorful and what a wonderful presentation! Love that addition of apples for some crunch and sweetness. Hope you had a great time with your aunt and uncle visiting from India! This healthy combo looks awesome! We eat a lot of kale at our house! This looks great with the dried fruit and apples. What an amazing mix of ingredients! This salad is surely very flavourful, not to mention how fabulous it looks.